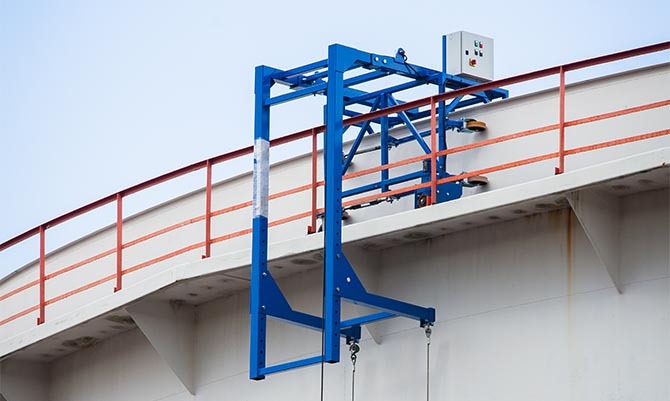 Like the 350VH, the rigging system for the 900VMB can also be used to steel blastconed, domed and floating roofed tanks. However, the biggest difference with the riggingsystem for the 350VH (with required winch system) is that this rigging system ismuch lighter. Therefore it can move around with a travelling speed of up to 0,5 metersper minute. The reason it is much lighter is because there is no need to mount a winch system on topof it. This brings many more advantages along with it than just the increased travellingspeed. You can read more information about the winch system for the 900VMB on thenext page.